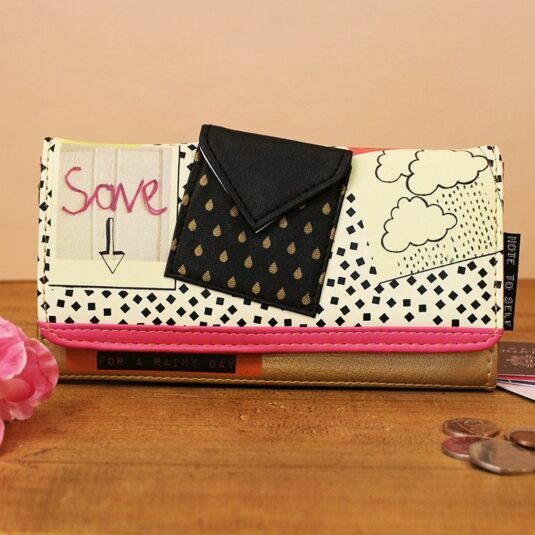 Saving for a rainy day is the theme for the Save Wallet. It features a cream background covered in tiny falling black squares. 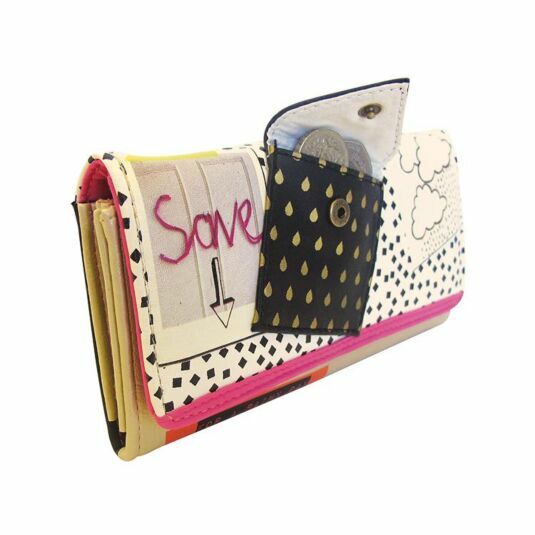 The front features a printed-on facsimile of a polaroid photo of the word ‘Save’ in pink yarn and an arrow pointing towards the wallet opening. Beside this a black faux leather pocket with gold raindrops printed on is held firmly closed by a press stud. 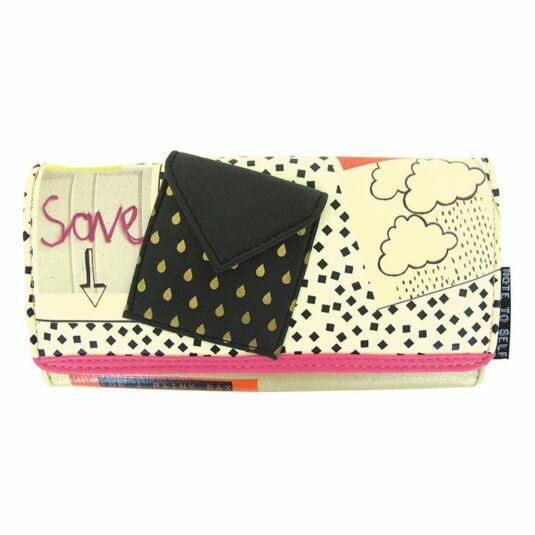 Another printed-on post-it note with cartoon rainclouds completes the front design on the pink-edged wallet flap. Just below the flap the wallet interior protrudes with an orange strip on a gold background. Printed on the orange strip in label-maker type are the words ‘FOR A RAINY DAY’. The inside of the flap is upholstered in pink faux leather with five credit card pockets, finished with a clear fronted pocket for photos, with a square Note To Self label sewn into it. The flap closes with a press stud. Behind the credit card pockets are two full length note pockets. 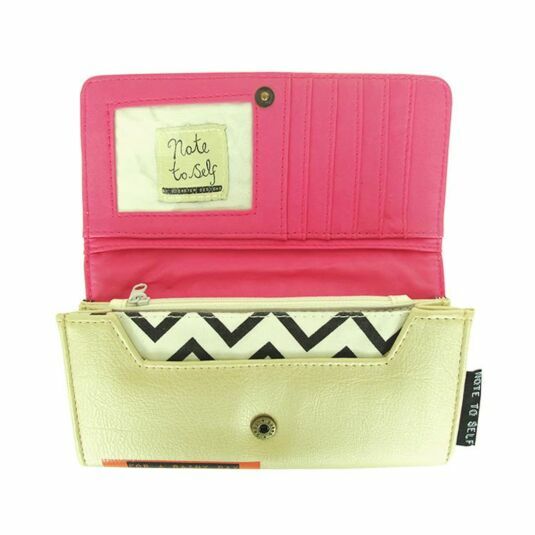 The interior of the wallet is divided into three pockets, the first of which is lined with chevron-striped fabric, the other two with plain white fabric. There is also a zip-closed coin pocket. A final pocket features on the back of the wallet, with a zip closure and a metal arrow zip pull. The back of the wallet is black faux leather. 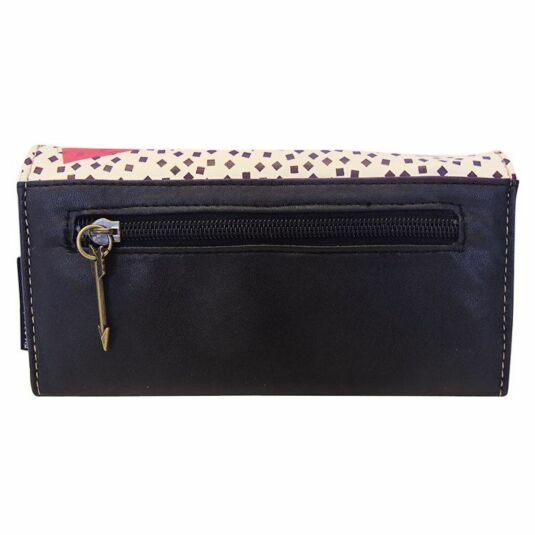 A practical wallet with plenty of storage compartments, and some secret pockets for hiding a little extra! Perfect for savers of all ages, from sensible(!) teenagers, to practical mothers and wise grandmothers.